The below was taken from Gospel 101 curriculum developed by Redeemer Church, Modesto. Click on the image to get it on its own page. The age of the manuscripts is also excellent. Possibly the oldest manuscript is a scrap of papyrus (p52) containing John 18:31-33, 37-38, dating from AD 125-130, no more than 40 years after John’s gospel was likely written. 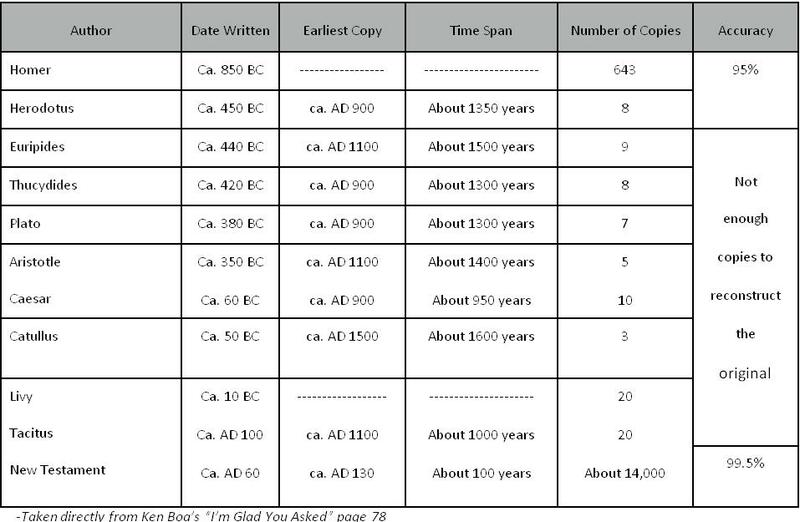 A non-Christian scholar, Carsten Peter Thiede even claims that he has dated a fragment of Matthew to about 60 AD. By comparing the ancient manuscripts we find that the vast majority of variations are minor elements of spelling, grammar, and style, or accidental omissions or duplications of words or phrases. Only about 400 (less than one page of an English translation) have any significant bearing on the meaning of a passage, and most are footnoted in Modern English translations. Overall, 97-99% of the New Testament can be reconstructed beyond any reasonable doubt, and no Christian doctrine is founded solely or even primarily on textually disputed passages. The Scripture quoted in the works of the early Christian writers (most 95-150 AD) are so extensive that virtually the entire New Testament can be reconstructed except for 11 verses, mostly from 2 and 3 John. Critics of the accuracy of the Bible routinely claimed that it was in fact a series of fables and legends that had developed over hundreds of years because there were not enough copies of ancient manuscripts to alleviate their skepticism. Curiously, a simple shepherd boy dealt a death blow to their criticisms in 1947. He wandered into a cave in the Middle East and discovered large pottery jars filled with leather scrolls that had been wrapped in linen cloth. Amazingly, the ancient copies of the books of the Bible were in good condition despite their age and harsh climate because they had been well sealed for nearly 1900 years. What is now known as The Dead Sea Scrolls are made up of some 40,000 inscribed ancient fragments. From these fragments more than 500 books have been reconstructed, including some Old Testament books such as a complete copy of Isaiah.